We fin towards a shallow sand ridge, fighting against an unusually stiff current that’s sweeping through one of the lagoons surrounding Viti Levu, Fiji’s main island. Leroy Aitcheson, my dive instructor, snags a piece of bamboo that’s passing with the current and jams it into the sand, indicating I should use it to help keep me in place during our safety stop. As my body fans out behind the bamboo like a flag, I can’t stop grinning, partially flooding my mask, but I don’t care. I’m elated. I’ve just completed the final skills of my PADI Open Water Diver course. Even better, I’ve completed them calmly, with confidence. I can’t be sure who is prouder of my achievement: me or Leroy. This was my third attempt learning to dive. On my first go-round, I couldn’t get past the mask-clearing – a hurdle many divers have wrestled with. I pulled out of that Open Water course and spent the next few weeks swimming laps in the community pool with a snorkel and half-flooded mask, familiarizing myself with the sensation. On my second go-round, a few months later, I sailed confidently through my pool skills, removing my mask with an underwater grin. I felt ready for the open water, which was going to be held in a freshwater, high-altitude lake in the middle of New Zealand’s winter. Conditions were less than ideal and the outcome was predictable: I faced more ‘issues’ than I could cope with and opted out of the rest of the course. A few weeks later, determined to knock my budding fear on its head, I joined another Open Water group back in the same lake. 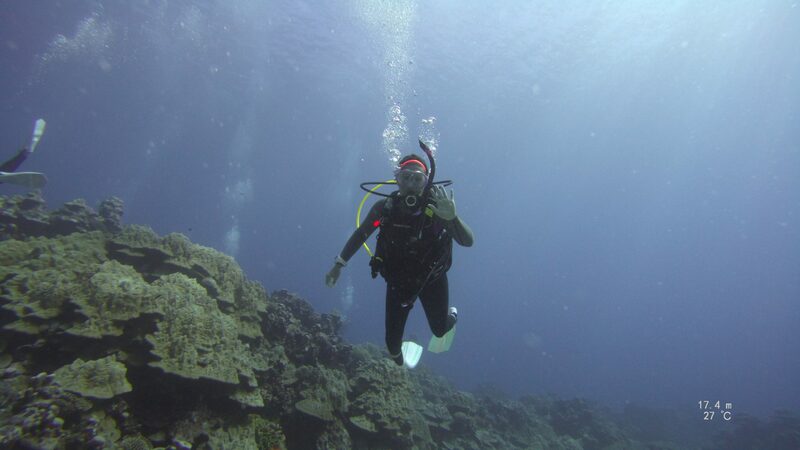 The conditions were better, but I was nervous the entire dive and battled with my buoyancy. I didn’t dive again for three years. I spent most of that time beating myself up about it. I love the water. Diving should have been easy for me, but now putting on a wetsuit triggered a surge of panic. I had developed a mental block the size of the Antarctic shelf, and I was ashamed of it. I had no desire to try diving again. That’s when I met Leroy. 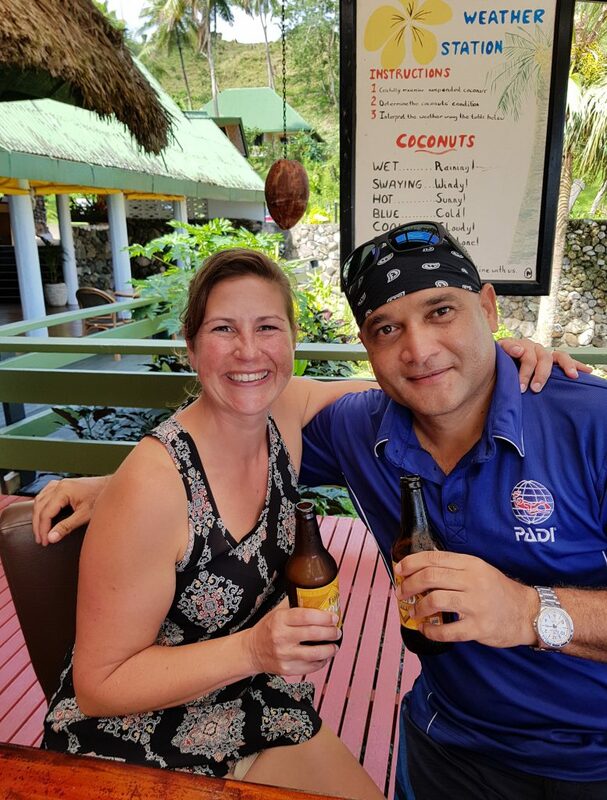 My husband Chris and I were holidaying in Fiji’s Yasawa Islands, and Leroy, a Fijian dive instructor with more than 20 years of experience, was the first diver I had met since my Open Water disaster who didn’t tell me to relax. Conditions couldn’t have been better – crystal clear visibility, warm water, no current – but it still took a few more days before I decided to give it a go. The turning point, for me, was that Leroy listened to me. He didn’t minimize the experience by telling me to relax – we discussed what happened and worked out a dive plan. 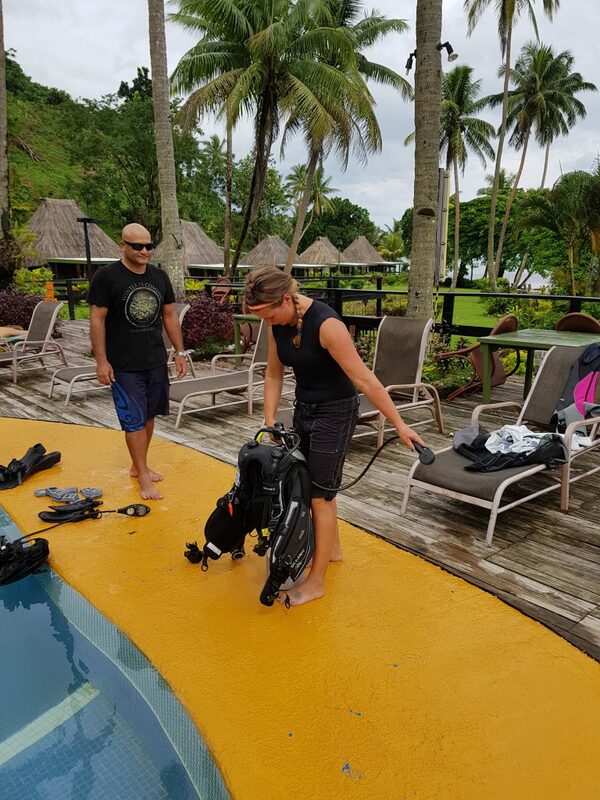 Before I even attempted my DSD skills in the shallows of the resort’s lagoon, we went for a short dive around the house snorkelling reef, hand in hand, first on the surface of the water, submerging a few feet once I felt ready. By the time I went through the DSD skills, I felt (marginally) more comfortable with my equipment and in the underwater space. The DSD itself was an eye-opener: as we circumnavigated a massive cabbage coral, fish in every hue and size darted around me, going about their fishy lives as if I wasn’t there. I’ve always wondered how much more, really, divers see than snorkelers. Now I know: it’s a different world entirely. I also learned that I’m comfortable under the water. It’s being on the surface that sparks the panic. Two years after that DSD, I returned to Fiji, but this time in less-than-ideal conditions. 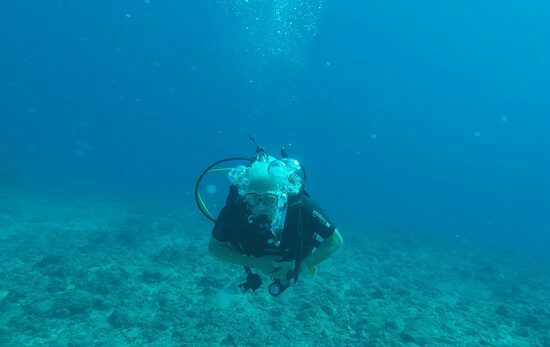 Fiji is renowned for its clear, calm waters, making it an optimal location to learn to dive, but I’m doing my Open Water course in the deep breath between two cyclones. The weather has muddied the water and debris stream by at a steady clip. There’s a lot more riding on this attempt than my previous two: Chris and I are about to embark on our year-long dive travel guidebook assignment for National Geographic (Fiji is our first stop), so the pressure is inadvertently on. The surface, with its storm chop, was still my biggest challenge. But rather than dismissing my concerns about the conditions, Leroy discussed them with me, and we made a clear plan for each dive and contingency. Understanding that explanation, having a plan, seemed to help, and by the third dive I was growing accustomed to the feeling of bobbing on the surface. The rest of the skills were a challenge in the current: Leroy had to hold my weight belt to keep me from floating away while I hovered, and bits of debris brushed against my face during the complete mask removal. However, I went about each skill methodically and confidentially. I felt a surge of pride with each success, hence my partially-flooded grin during my sandy safety stop. I was now certified to dive. I was excited to dive. Perspective comes with time. 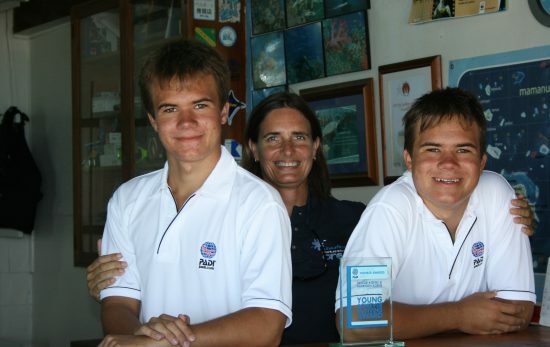 My learning to dive journey encompassed five years. I’ve now had 20 dives in 10 countries over five months. I’ve descended through a cloud of vampire triggerfish in French Polynesia. I’ve had a pair of tawny nurse sharks weave in between my fins in Belize. A cleaner shrimp gave me a manicure in the British Virgin Islands. And I feel like I’m seeing the world with new eyes. I have had set-backs: I aborted two blue water dives because I didn’t feel comfortable. It turns out that, along with chop on the surface (which I’m getting better about), I still need visual references underwater – a reef. A wall. Something to orient me, which is fine for now. I’m glad I kept at it. Diving has opened up a world I never could have imagined, and now I can’t wait for my next dive. At the time I was doing my Open Water course and early dives, I was finishing writing a book for National Geographic entitled 100 Dives of a Lifetime: The World’s Ultimate Underwater Destinations. I spent the better part of a year researching and speaking with divers from around the world, including Nat Geo’s stable of underwater photographers and Explorers. Their passion for diving was contagious. Their descriptions of the underwater world filled me with wanderlust, inspiring me to give it another try. And now that world is opening up for me, a sense of discovery that equals any I’ve experienced on land. And give yourself the best chance of success. 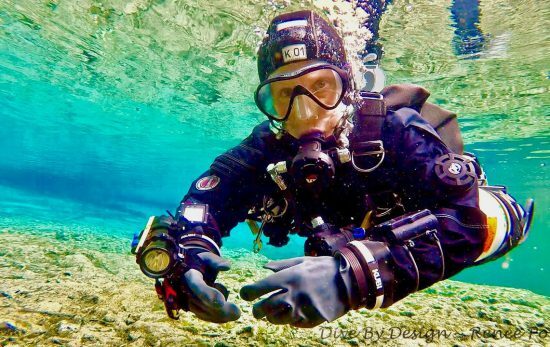 Buying gear early is always debatable, but it helped me: Australian Underwater Products kitted me and Chris out with gear to test for the year we’re on the road (a variety of major brands), and I found that having quality gear I’m familiar with helped my comfort level. 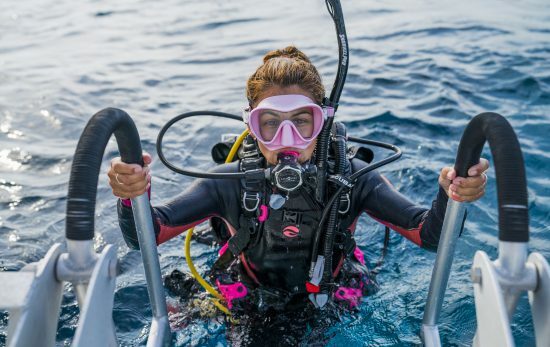 I’m diving with the standard set-up – no wing BCDs or unusual occy configuration – and I know how my gear should feel, I’m familiar with the condition it’s in, and I feel it made a big difference, especially during my Open Water course. People for whom diving came easily will possibly roll their eyes, but learning to dive was one of my biggest achievements. I had to face my fears. It was yet another lesson in trusting my judgement. In tenacity. 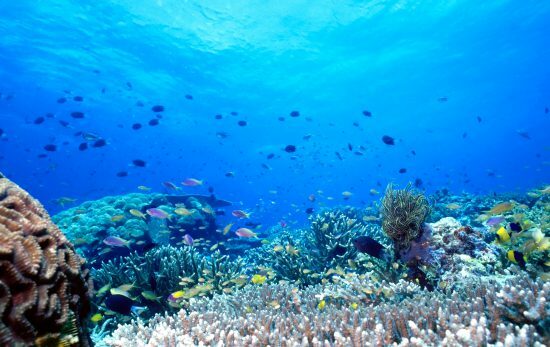 The rewards for persevering, however, are beyond my imagination – the ocean covers more than 70% of our planet, and more than 80% of our oceans are “unmapped, unobserved, and unexplored”, to quote the National Oceanic and Atmospheric Administration (NOAA). I have a new world to discover at my fin-tips – it’s right there, waiting, and I can’t wait to dive in.